Singapore Business Review is the definitive magazine for Singapore's business elite and is the ONLY magazine that can guarantee its reach to CEOs and senior executives of the major companies and SMEs in Singapore. Published bi-monthly, SBR's editorial is a mix of news, reviews, analyses on key industries and themes as well as regular sections to keep readers informed of vital issues as they affect them. 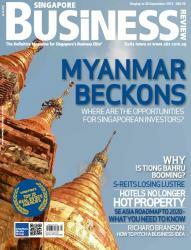 No other publication has as relevant content to business decision makers as Singapore Business Review. Stay informed about the latest in Singapore's vibrant business scene for your company throughout the year by subscribing to SBR corportate subscription for only S$495. You will receive 5 copies for each issue 6 times a year. ENTER THE NAMES of the people you want to register on the COMMENTS box.